I am excited that on Monday afternoon Eric Prud'hommeaux will present the work of the LODD working group to the chemistry community. 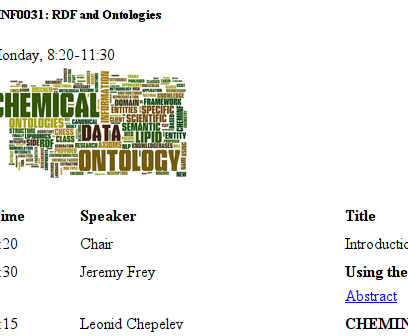 The symposium contains three half day sessions with topics on computing, ontologies, and applications, all chemistry oriented. The goal of the meeting is to get together people using RDF technologies in chemistry, and the list of talks from around the world shows that this goal has been reached. The program is diverse and exciting, and I am very much looking forward to meeting all participants to discuss challenges and cool solutions. People interested in joining, can sign up to the meeting mailing list. Besides that the webpage is in XHTML+RDFa, the source is also available on GitHub (well, you really download the source code anyway), allowing people to happily fork, make changes, and perhaps make the page as triple-dense as is possible. I am also keen to have mastered some jQuery skills, and the Abstract links on the webpage use jQuery to show and hide them.